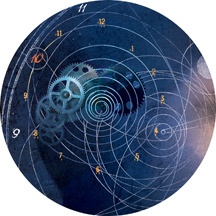 New research is shedding light on the master timekeeper inside our brains. This past July, Johns Hopkins biologist Samer Hattar traveled across seven time zones to visit his family in Amman, Jordan. In the first few days after his arrival, besides spending time with relatives and friends, Hattar made sure he followed a special schedule. "Once I reach Jordan, which is usually 5 p.m., I fight sleep really hard till 9 or 10 p.m.," he explains. "The next two days are key. The first day around 11 a.m., I go out and walk in the sun for one hour minimum. The next day, I do the walk two hours earlier. I try to avoid light early in the day." This ritual, says Hattar, helps to fast-forward his circadian clock to Jordanian time. Now, instead of feeling fuzzy-headed and sluggish for a week, he feels like his normal self after two days. But that's not the only time Hattar pays close attention to his body's clock. He rises at 4:30 or 5 every morning and goes to sleep at 9:30 at night. On work days, Hatttar tries to take a walk every afternoon around the Homewood campus. He has changed all of the light bulbs in his home to low-intensity bulbs. "If you came to my house at night, you'd think I'm a cheap guy," he says with a smile. All of these practices, he says, are intended to keep his body clock aligned with the clock of the external world, determined by when the spinning Earth countenances the sun. Hattar, who holds joint appointments in the Krieger School of Arts and Sciences' Biology Department and the School of Medicine's Neuroscience Department, is an expert on this circadian clock, the master timekeeper we all have in our brain that governs our sleep and wake cycles and many other body fluctuations. He doesn't study the circadian clock of people, though. He studies mice, in particular, the cells, genes, and neurochemicals that help to set the mouse's biological clock. But his results and those of colleagues in the field who study people, he says, have caused him to rethink his own habits. So about four years ago, he adopted a more circadian clock-friendly lifestyle. He now feels better. Or at least, he adds, he believes he does. For someone with such concerns, Hattar has the perfect office. Its two enormous windows, overlooking a lush bank of trees, flood the high-ceilinged room with natural light. On a recent morning this past summer, Hattar gazed out these windows in Mudd Hall, on the Homewood campus, before settling into a desk chair. "I feel sorry for people who work in cubicles," he said. "The worst is when someone works in a cubicle all day away from natural light, and then goes home to a house illuminated with bright, artificial light." That's a recipe for disrupting your clock. Studies have suggested that upsetting the clock's natural cycle can have serious health consequences. Shift workers, for instance, an estimated 15 million Americans, have higher rates of heart disease, diabetes, ulcers, and certain forms of cancer, according to Hattar's colleague Steven Lockley, who studies sleep and circadian biology at Harvard Medical School. Hattar's own research explores another aspect of light's influence on the biological clock. With a grant from the David and Lucile Packard Foundation, he is using mouse models to study how a misaligned circadian clock might affect thinking, learning, memory, and mood. It's not just shift workers who might be affected. It's also all those cubicle workers, the late-night Web surfers, the caffeinated go-getters. It's not just the frequent fliers or shift workers who might be affected, says Hattar. It's also all those cubicle workers, the late-night Web surfers, the caffeinated go-getters, the kids who stay up late to blog and IM and channel surf — basically all those who push their circadian clock to its limits. And those numbers appear to be growing. In its annual polls of Americans' sleep habits, the National Sleep Foundation has found that we're getting less sleep than we used to. Between 2001 and 2005, the percentage of American adults getting at least eight hours of sleep per night dropped from 38 percent to 26 percent, while the number getting less than six hours rose from 13 percent to 16 percent. Many of us, says Hattar, may be feeling the effects, even though we don't realize it. "I believe that we have been so desensitized to light because we see it so much, we are not aware of what it's doing to us," says Hattar. "We in the industrial age of light are living under a continuous subtle jet lag because we are not doing what evolution intended." Electricity, the silicon chip, and satellite communications have given us super powers — the ability and the temptation to defy the sun. But when we can expose ourselves to light 24/7, we may have to face some consequences. We may eventually come crashing down from the heights of our super powers, just like the mortal Icarus, flying too close to the sun with his wings of wax. While Hattar's study could say something about health, he is, at heart, a basic scientist. In Jordan, he was raised in a Christian family and planned to become a priest. But by age 15, he had discovered a new passion — science, especially genetics. "I loved genetics the minute I heard about it," says Hattar. "I love to be able to manipulate genes and see what happens when you change genes. You have such a powerful tool." At first, his passions seemed to conflict. But when Hattar learned of the work of the pioneering geneticist Gregor Mendel, and learned that Mendel had been an Augustinian monk, he thought that he, too, could pursue both vocations. Today, Hattar does not wear a clerical collar or monk's habit, but T-shirt and casual pants — the uniform of an academic scientist. He did his doctoral studies at the University of Houston, where he focused on circadian biology. He was intrigued, he says, by the idea that different events happened in a plant, animal, or cell depending on the time of day. In his own research, Hattar found that light could activate different genes depending on whether it was morning, afternoon, or evening. Samer Hattar's research on the circadian clock has led to his belief that we are living in a state of continual jet lag. "We are not doing what evolution intended," he says. People have a circadian clock. So do mice, sea slugs, fruit flies, dandelions, the fungus Neurospora, certain bacteria, and almost all other organisms. In people, the master clock also imparts structure to the body's operations. In early morning, body temperature ebbs. Soon the stress hormone cortisol surges, insulin is produced at its maximum rate, and testosterone (in men) peaks. Other factors, hormones, and enzymes fluctuate throughout the day, and by around 9 p.m., the sleep hormone melatonin begins to flow. So though you might think you are a free agent who can improvise your schedule as you like, when it comes to human biology, free will is something of a mirage. By the time Hattar entered the circadian biology field, scientists had found that the master clock resided in a V-shaped cluster of cells in the brain's hypothalamus, near where the optic nerve enters the base of the brain. They named the cluster the suprachiasmatic nucleus (SCN). Researchers had also observed that each person's SCN beats out a slightly different length of day. So my clock might revolve once every 23.5 hours, while yours might repeat every 25 hours. If left to its own devices, each person's clock would "free-cycle" on its own idiosyncratic schedule. That doesn't happen, though, because the sun (or another form of light) resets, or "entrains," the clock every day to the 24-hour world clock. But questions remained, including one that would eventually intrigue Hattar: What mechanism did the clock use to detect light? In other words, how did the clock "know" whether it was night or day, dusk or dawn? Until then, scientists had largely assumed that the mechanism was the same as that used for vision. In that case, the eye's retina detects light through the use of photoreceptors. These light-sensitive cells convert incoming light energy into nerve impulses that travel to the brain's visual centers. For decades, scientists had held that the retina contained just two types of photoreceptors: rods, which sense very low levels of light, and cones, which distinguish different colors of light. The retina's multilayered structure also harbored other types of cells, including a family called ganglion cells, but none of those responded to light, according to this model. However, research findings from several arenas were leading some scientists to question whether this model explained everything about the retina and the circadian clock. One finding came from studies of people who are totally blind, many of whom have a history of sleeping problems. For example, Suzanne Erb, blind since infancy and now enrolled in a research study at Brigham and Women's Hospital, in Boston, says that she has had problems sleeping for as long as she can remember. When she was a child, she'd toss and turn in bed for an hour or two until she couldn't stand it any longer. Then she'd pull Heidi, Little Women, or another novel from its hiding place under her covers. Long into the night and often until dawn, she would read, her small fingers sailing over the Braille letters on the pages. The following day, her body would ache for sleep. "You're turning your days into nights," her mother told her. In the 1990s, Harvard sleep medicine specialist Charles Czeisler began studying totally blind people. Most, he found, had sleeping problems like Erb's, suggestive of a circadian rhythm disorder. But some did not. That observation was puzzling because if rods and cones were the path to the circadian clock, then everyone who lacked them should have circadian clock disorders. But here were some totally blind people who appeared not to have such problems. Hattar's studies will support the idea that misaligning the daily clock can lead to serious consequences, including subtle learning deficits. It's a bold idea, he admits. Another intriguing finding came from studies conducted by a biologist named Ignacio Provencio. While at the Uniformed Services University, Provencio had been studying light-sensitive proteins that enable photoreceptors — rods and cones — to absorb light. Each photoreceptor produces its own special light-sensitive protein. Provencio had found what he believed was an entirely new light-sensitive protein in the mammalian retina. However, this protein did not appear to be located in rods or in cones, but elsewhere in the retina. Provencio called it melanopsin. To some scientists, only one conclusion could explain the findings of Czeisler, Provencio, and others who had conducted related studies: The retina must have a third photoreceptor, one responsible for detecting light to set the master clock. Moreover, this new photoreceptor might use melanopsin to do its job. Other scientists remained unconvinced. Some maintained that the "new" photoreceptor was actually a subgroup of rods or cones, whose numbers were so small they had eluded researchers. Hattar decided to study melanopsin in 2000, soon after he began a postdoc in the lab of neuroscientist King-Wai Yau, at the Johns Hopkins School of Medicine. Hattar initially had planned to focus his research on a different topic, but a visit to the lab by Provencio inspired him to shift to melanopsin. From reading the literature and talking with Provencio, says Hattar, he was confident that melanopsin represented a novel photoreceptor. But to convince the skeptics, he and other scientists would have to gather hard evidence. So over the next few years, Hattar, Yau, and others in Yau's lab examined the melanopsin hypothesis more closely. In 2002, the team published its results in Science. Another study in the same issue, reported by Brown University neuroscientist David Berson, complemented the findings. Berson had isolated from the retina a group of ganglion cells that connected to the SCN. He had shown that these cells, apart from other components, could respond to light on their own. Together, the articles made the journal's list of most significant breakthroughs of the year. Such basic science has revamped the model of the retina, says Harvard's Lockley. "It's all cutting-edge stuff. We thought we knew everything about the eye. But in the past 10 years, with Samer's work and others', we've discovered that we did not. Now we have a whole new focus." "The whole thing is unexpected," says Yau. "If you had asked me 20 years ago if there was another cell type in the eye that could detect light and send a signal to the brain, I would have laughed." Five years later, Hattar still sounds wondrous when he talks about his results and their implication that we "see" light in more ways than one. 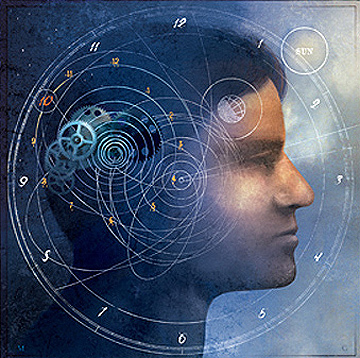 While the first pathway involves our conscious — we see the result — the second is subconscious — we do not realize that light is entraining our master clock. Hattar says he is fascinated by these differences. Why are there two pathways? Our visual system reveals whether it is night or day, so why doesn't that information get communicated to the clock? Why does the brain have a separate pathway to let it know the level of lighting? 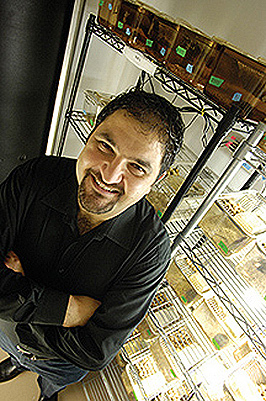 In 2004 Hattar began his own lab at Homewood. And while such intellectual questions continue to intrigue him, he is also pursuing studies that may have practical applications in medicine. Namely, he'd like to know how melanopsin and the circadian clock affect health and well-being. Does disrupting this system jeopardize health? To study such questions Hattar used genetic techniques to generate a mouse that lacks melanopsin cells. In theory, these animals would be able to see but would not be able to detect light to set their circadian clock. Such an animal could serve as a model for studying situations in which the daily clock is desynchronized, as occurs in jet lag and shift work. Hattar and graduate student Cara Altimus have put the animals through a battery of tests to determine whether the mice behave as predicted. Since a lab mouse spends most of its waking hours on an activity wheel, wheel-running serves as a proxy for an animal's sleep/wake cycle. When the lights are on, a normal mouse sleeps. (Mice are nocturnal.) When the lights are turned off, a normal mouse will hop on its wheel and start running. If an animal cannot tell the difference between light and dark, it follows a sleep/wake schedule governed solely by its internal clock. Researchers use computer-generated records of each mouse's wheel-running activity to see whether an animal entrains to light cues or simply follows its internal rhythms. "It's very clear," says Altimus. "Dramatic." The mice can see, but they cannot "see" light to set their circadian clock. The researchers are now in the process of conducting a whole new series of tests on the mice to gauge their cognitive abilities and anxiety levels. Impairments in the animals would support the hypothesis that compromising the circadian clock can also compromise learning, memory, or even mental health. Because they have not yet published the results of those studies, Hattar is not willing to discuss them in detail. He will say, however, that they are "impressive." His studies, he believes, will support the idea that misaligning the daily clock can lead to serious consequences, including subtle learning deficits. It's a bold idea, he admits. "I'm putting it out there to be challenged," says Hattar. "But I really believe it." Nothing he's seen so far in his or colleagues' results has persuaded him to stop his regular habit of rising before dawn, going to sleep early, and keeping his lights dim in the evening. If anything, his results have made him more concerned about the harm that irregular exposure to light might cause. "I may be 'placebo-ing' myself," says Hattar. He's aware that the improvements he's felt in his own health and spirit might just be comparable to taking a sugar pill. Likewise, he cannot yet say just how much harm might come to any of us from our light-filled environments. "Here is where I need to be careful," he says. "You look at Americans. There are so many insomniacs. Stress levels are high. Many factors could be affecting us — our food, many environmental factors. But I know that no matter how upset I am, when I go into the sun, I feel better." Freelancer Melissa Hendricks teaches nonfiction writing in the Johns Hopkins Master of Arts in Writing program.